Paper Monument Project #022: On May 8, 1867, New Orleans’ streetcars were integrated, and would remain so until Louisiana law mandated segregation again in 1902. When the first mule-drawn streetcars were introduced to New Orleans in the 1820s, no black passengers, free or enslaved, were allowed to ride. Free blacks challenged this new indignity atop the erosion of long-held rights; under territorial administration and early statehood, free blacks in Louisiana were disenfranchised in 1812, and a wave of legal segregation began in 1816. Under pressure, several streetcar carriers initiated the “star car” system; a limited run of separate streetcars for black passengers marked conspicuously with large stars on all sides. Over the next several decades, free blacks engaged in intermittent protests as they resisted being relegated to separate cars. On April 28, 1867, William Nichols forced his way onto a white car and was physically removed by starter Edward Cox. Nichols was arrested for breach of peace, but the charges were dropped. Determined to get the streetcar policies into the courts, Nichols sued Cox for assault and battery. The streetcar companies, equally determined to retain segregation, but eager to avoid lawsuits, colluded on a policy of “passive resistance.” Streetcars boarded by black riders would simply stop, and drivers were ordered to wait the activists out. P. Ducloslange tested the policy on May 3 by boarding the St. Charles streetcar. In an hours-long endurance battle that left just the two men on the car, the driver refused to move the streetcar and Ducloslange refused to leave it. The next day, Love Street, the continuation of Rampart below Esplanade, became the locus of more widespread protest. A congregation of black men and boys assembled, shouting at the white streetcars, blocking the tracks and throwing things. One of the leaders, Joseph Guillaume, leapt onto a passing white car. The driver, breaking with “passive resistance,” tried to forcibly remove Guillaume, who snatched the mule’s reins, threw the conductor out of the car, and drove off himself, leading the Third District police on a chase before his arrest. By the evening of May 4 the mood had soured, while the crowd continued to grow. In squads of fifteen to twenty, black men and boys dispersed along the streetcar lines, boarding white cars. Soon angry gangs of white men and boys were roaming the streets as well. By May 5, the protests teetered between carnival and riot. The crowd at Congo Square grew to five hundred, aided by recruitment from passing star cars as well as the entertainment of a white car seized and used as an impromptu parade float. On Canal Street, however, the carnival atmosphere boiled over as a group of black men boarded a streetcar and clashed with an armed band of white passengers waiting for just such an opportunity. As skirmishes broke out across the city, Mayor Edward Heath, went to Congo Square to address the demonstrators himself. Evoking the prior year’s riot at Mechanics’ Institute, Heath called on the crowd to disperse, promising that streetcar policies would be reconsidered. By May 8, New Orleans’ streetcars were integrated, and would remain so until Louisiana law mandated segregation in 1902. 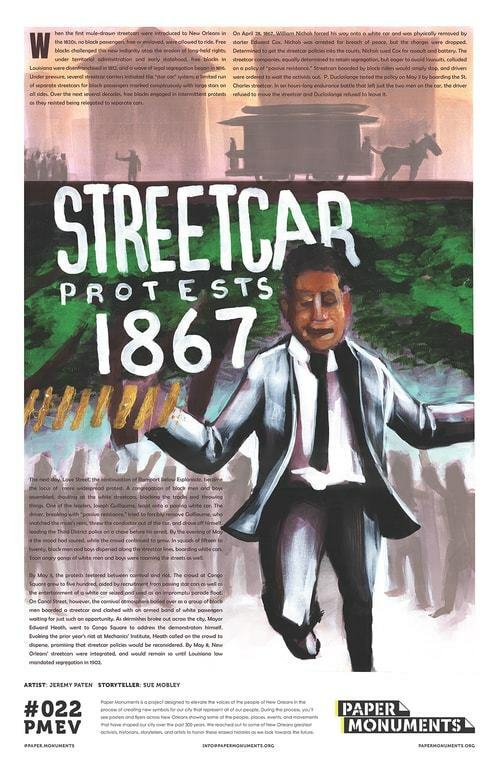 "Paper Monuments Poster #022: Streetcar Protests 1867" ~ Source: Image courtesy of Paper Monuments. ~ Creator: Paper Monuments ~ Date: 2018. 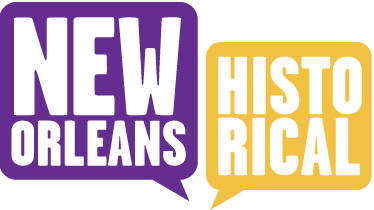 Paper Monuments, Jeremy Paten, Artwork, and Suzanne-Juliette Mobley, Narrative, “Streetcar Protest 1867,” New Orleans Historical, accessed April 19, 2019, https://neworleanshistorical.org/items/show/1433.